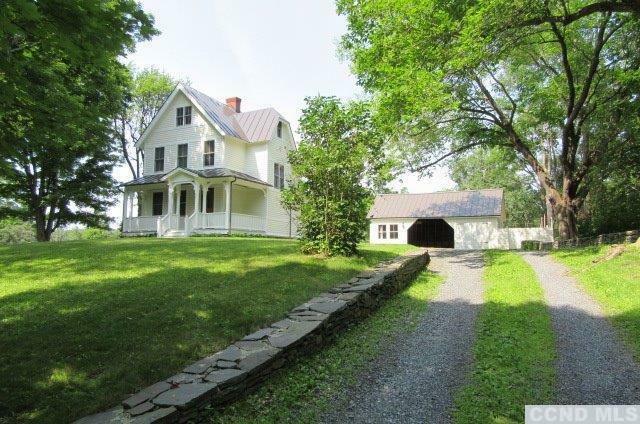 On picturesque River Road, minutes from Rhinebeck NY sits a fully restored 1890 Victorian Farmhouse on 9.6 acres of pastoral land with luscious landscaping and gardens. Restored with every attention to detail, Spalted Maple Countertops, the open concept chef's kitchen is a cooks dream. The center island is large enough for prep with still room for cocktails and appetizers. Yum. Liebherr fridge, Fisher Paykel drawer dishwasher and Capitol gas stove with hood. There is a matching 9' Spalted Maple dining table (can be purchased separately) that seats 12, all overlooking the westerly sunsets. The living/entertainment room is ready for binge watching and entertaining. There is also a convenient full bath/laundry/storage on the main floor. The beautiful original wooden staircase was built by local shipbuilders in the off season of the Hudson ship building. Walls were removed to create a gracious Owner's Bedroom, guest bedroom/office, walk-in closet.